Apna Khata is an initiative of Revenue Department of Government of Rajasthan to computerize the complete system of land records in the state. With the launch of Apna Khata online portal, all the land records are updated online. People can check and obtain any detail about their landholding records in few minutes. 2 How to check Copy of Records of Right (Jamabandi Nakal) 2019? राजस्थान अपना खाता, खसरा खतौनी, ऑनलाइन जमाबंदी: Apna Khata is specially launched to provide copy of Record of Rights (Jamabandi Nakal) online to the people of state. Earlier they had to visit the revenue department and had to waste their whole day to get the ROR but with the online portal, they can obtain it in a very less time without going to the office. To get more information about Apna Khata you can scroll down. Here you will get complete details about this online portal, its advantages and how can you obtain your ROR online. What are the uses of Rajasthan Jamabandi Nakal/ Record of Rights (ROR)? With the help of ROR, one can check the ownership of an ancestral land or any other property in state. ROR helps to provide necessary information about all the activities that are carried out on the land and also about the type of land. ROR is required at the time of mutation of land/ sale of land. One can apply for a loan on the basis of his/her ROR. In case of any litigation, ROR can be produced as the proof of land record. With the help of ROR, one can obtain information about the agricultural aspect of a land. What are the Benefits of Apna Khata 2019? Through Apna, Khata individuals can check details about their land records as and when they want. It saves time and effort. Computerization of land record saves time and effort of people. Earlier, people has to visit the Revenue department or patwari office to get even a single piece of information about their land record. The digitization of land records has reduced the manual work. Apna Khata has increased transparency in land record system. It helps in reducing crime related to land, illegal possession of land, scuffles, grabbing of other’s land etc. Through Apna Khata one can check updates of their land records on a regular basis. With the help of Apna Khata, one can easily obtain their measles no. (Khasra No. 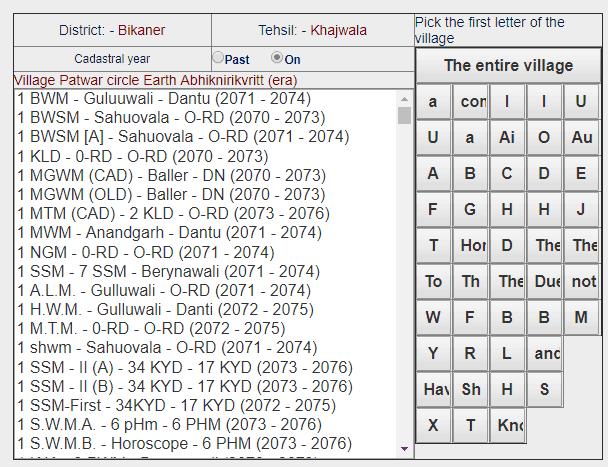 ), account no., Khewat, Jamabandi (ROR) and other land details if they have internet access. How to check Copy of Records of Right (Jamabandi Nakal) 2019? After the computerization of land record system, it has become so easy to get you land record information in few minutes. But there are some people who still finds difficulty in accessing their account online. If you are one of them then you do not have to worry. Here we have shared complete procedure in very easy and simple steps by which you can get your land details online without any difficulty provided you need to have an internet access. We have also added the picture in each step to help you more. Now, from the map given in the homepage, you have to select your respective district by clicking on the name. In this page who will see the names of all the tehsils falling under that district. You have to select your district. On selecting your tehsil you will be redirected to a new page as shown below. Here, you have to select the cadastral year for which you are looking for your ROR. After entering all the required details, you have to click on “Get duplicate” button. Copy of Records of Rights (Jamabandi nakal) will appear on the screen. It will include details like name of the royalty, account no., father’s/ Husband’s name, and other record of land. You can take a printout of this page for references. You must view your account regularly by following the same procedure to check whether the account is getting updated or not. The information provided in the portal is only for the purpose of information. This cannot be used as authorized or certified copy to be presented at any court. If citizen of Rajasthan wants to get authorized copy of Records of Rights, they can obtain it from the selected kiosks or from the District Data Centres. Along with Apna Khata, information about land records is also maintained at the District Data Centre and therefore, those who want to get an authorized copy of their ROR, they can collect it from these centers. One who is looking for his/her ROR on Apna Khata must have a Khasra no., or account no., or name of the account holder and other required information in order to obtain the copy of ROR. Rajasthan citizens are suggested to check and get their jamabandi nakal or a copy of record of rights every year so that they can check whether the details are being updated regularly in the revenue records or not. For any query related to ROR, you can contact the revenue officer of your respective district. The contact details can be obtained from the “Contact” section of Apna Khata portal. Apna Khata is an online portal of Revenue Department of Government of Rajasthan, Bihar, Patna, UP etc. Through this online portal people can obtain the copy of their Record of Rights which is commonly known as Jamabandi Nakal online. They do not have to visit the concerned government office particularly to get the copy of ROR. With the introduction of Apna Khata, the manual process of preparing nakal jamabandi have been discontinued. A khasra is document in which official detail of agricultural data is stored for specifying land and crop details. Bhulekh is word used to describe land record and used for land record software in many states like UP, Bihar, Rajasthan etc. Benefits of Rajesthan Apna Khata initiative? Through Apna Khata one can easily check access official land records and related information online. The computerization of land records is benefiting people largely. Through this, a common person can easily get direct access to the information about his/her landholding in the state at any time and from any location without visiting the revenue or Patwari office personally. For the convenience of the people, data in Apna Khata is provided in both English and Hindi Language. The data on the web server is updated on monthly basis. The backup of the data of all the tehsils pertaining to a particular district in Apna Khata is also maintained at the district level. Apna Khata not only provide access to the copy of records of rights with ease but through this portal citizen can obtain RSN details, notified tehsil list, administrative hierarchy in the state, Kiosk Panchayat, latest news etc. If you have any question then ping us by sending your query in the comment box below. Our team is there to help you in regards to Rajasthan apna khata jamabandi nakal 2019 online questions.